APE (Monkey's Audio) is a popular lossless audio format, which doesn’t cause any loss of audio quality during data coding and compression. Therefore, APE files are large and it can be time-consuming to transfer an APE file. Moreover, APE has poor compatibility with devices and programs. By contrast, MP3 is a lossy audio format that discards some audio data for smaller size but still keeps good quality. Actually, it is difficult to notice the differences between APE and the converted 320kbps MP3 with naked ears. Most importantly, MP3 is a universal audio format that provides native support for almost all multimedia devices. Overall, it’s a good choice to convert APE to MP3 when you don’t have enough space to store large APE files or need to play or edit APE with a specific program. 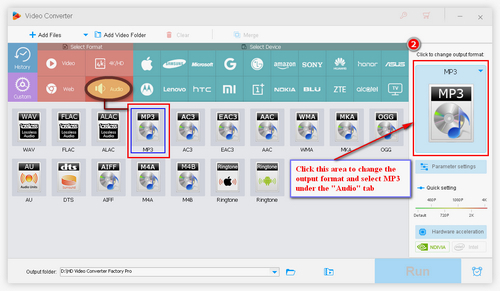 WonderFox HD Video Converter Factory Pro is a professional APE to MP3 converter. It offers the simplest and quickest way to convert your large APE files to MP3, AC3, AAC, DTS, WAV, FLAC, ALAC, etc. The software also enables you to extract audio from video, edit video & audio files, and download music online. 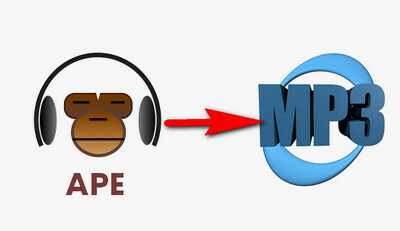 Need a straightforward and quick way to convert APE files to MP3? WonderFox HD Video Converter Factory Pro will be your best choice. It supports batch conversion mode and hardware acceleration and can achieve up to 50 faster conversion speed. The interface is user-friendly and all features are self-explanatory. It only need simple three steps to finish the APE MP3 conversion. 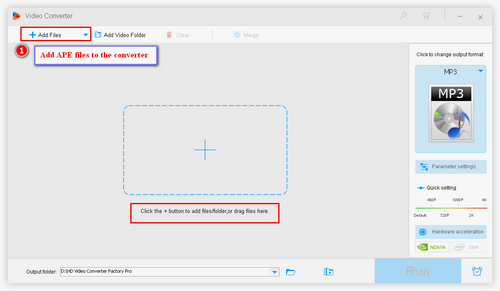 Open HD Video Converter Factory Pro. Click on “Add Files” to select the APE files from your PC. Or you can directly drag and drop the target files into the window. Click on “Output Format” button on the right. 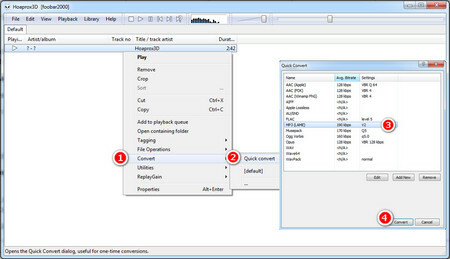 Choose MP3 profile under Audio tab. As the picture shows, you can not only convert APE to MP3, but also convert APE to WAV, APE to FLAC and more other audio formats. Specify the output path by clicking on the Folder icon on the bottom. Finally click on “Run” to start the conversion. 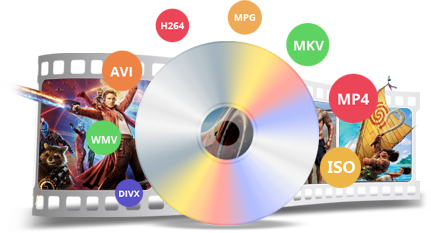 With the fully support for GUP acceleration and multi-core CPU, HD Video Converter Factory Pro can convert large APE files at an instant. Tips. It has built in editor, which enables you to merge music, cut audio and so on. What’s more, the functional software works as a music downloader to download music video from YouTube, Facebook, Vimeo and other 300+ sites. Step 2. Run Foobar2000. Click on File > Preferences or press Ctrl+P. Select Components on the left and then press Install button on the right to import the Monkey's Audio Decoder component you installed just now. Click OK to restart Foobar2000. Step 3. Click File > Open to import APE files or directly drag and drop them into the window. Step 4. Select all APE files, right-click and choose Convert > Quick convert. Then choose MP3 (LAME) and press Convert. You can click on Edit to change the audio quality to 320kbps. Step 5. 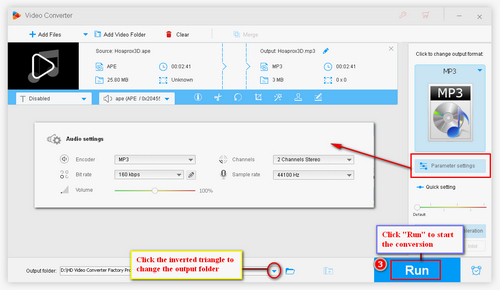 Specify the output path to convert APE to MP3 at one go. Tips. If you want to convert a large APE file with CUE file, you need to split the CUE file. Check this tutorial to learn more >> how to split CUE file. We have selected some online video converters that support .ape to .mp3 conversion. 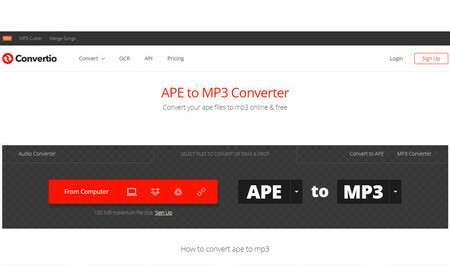 Just upload APE files into the sites, choose MP3 as output format and then start the conversion. It’s quite simple to convert APE to MP3 online yet you need to be aware that all the online APE to MP3 converters limit the size of uploads so you should convert small APE files. Of course, slow conversion & upload speed is the common defect of online converters. If you happened to experience extremely slow process speed, you can resubmit the APE file or turn to other methods. The software promises the quickest and easiest way to convert large APE files to MP3, FLAC, ALAC, WAV, DTS, WMV, and other audio formats. It’s 100% clean and powerful. You can use it to not only convert audio files, but download online videos and music, edit songs, extract audio from video, modify the output files parameters, etc. 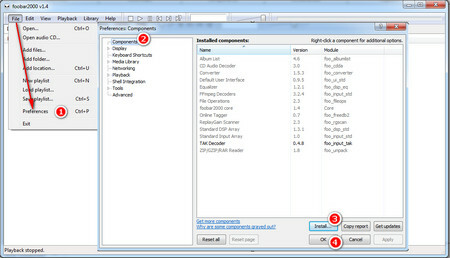 Free download the software to use all the features. The useful software is designed to bypass any DVD copy protection and convert DVDs to digital videos, and even audio files. It also supports 1:1 DVD to ISO image and DVD folder quick copy so that you can make exact copy from DVD.